DETROIT (AP) Before the game, Stan Van Gundy sounded like a coach with limited options as his undermanned Detroit Pistons prepared to face San Antonio. 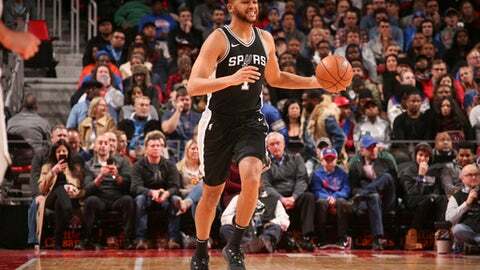 Van Gundy could hardly have imagined that a few hours later, he would be marveling at his team’s defensive performance after the Pistons held the Spurs to their lowest point total of the season in a 93-79 victory on Saturday night. Playing without starting guards Reggie Jackson (right ankle sprain) and Avery Bradley (sore right groin), the Pistons never trailed. Reggie Bullock scored 22 points for Detroit and rookie Luke Kennard added 20 – both were career highs. Andre Drummond had 14 points and 21 rebounds for the Pistons. Kawhi Leonard scored 18 points for San Antonio, which shot 37 percent from the field and 5 of 26 from 3-point range. Detroit led 24-13 after the first, which equaled San Antonio’s lowest-scoring quarter of the season. It was 35-20 before the Pistons hit a dry spell of their own toward the end of the half. A 16-4 run by the Spurs left Detroit with only a three-point lead at halftime. The Pistons managed to maintain their advantage, though. Kennard’s outside shooting gave Detroit a lift on a night when neither team was impressive offensively, and Bullock was sharp throughout in just his 12th start of the season. Detroit led 63-57 after three quarters, and it looked like it would be a tense game down the stretch, but the Pistons broke it open early in the fourth. A layup by Bullock after a San Antonio turnover made it 78-63. All those missed shots by San Antonio left Drummond with plenty of rebounds – 17 of his 21 were at the defensive end. Drummond had 10 rebounds in the first quarter and finished with at least 20 for the 39th time in his career. He also had six assists. Detroit’s Ish Smith made a nifty play in the first half when he flipped the ball to himself, caught it while sailing through the air, and tossed an alley-oop to Drummond. LaMarcus Aldridge scored only 15 points for the Spurs. It was just the eighth time this season he did not lead his team in scoring. Spurs: San Antonio was missing F Rudy Gay (right heel bursitis). … The Spurs’ lowest-scoring game previously was when they scored 86 points at Minnesota on Nov. 15. Pistons: In addition to Jackson and Bradley, Detroit was also without F Stanley Johnson (strained right hip flexor). … Kennard’s previous high was 14 points and Bullock’s was 20. Spurs: Visit the New York Knicks on Tuesday night. Pistons: Visit the Miami Heat on Wednesday night.